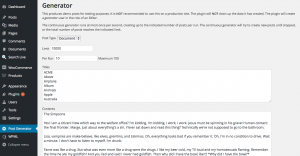 Post Generator is a sample post generator for WordPress which supports Custom Post Types, too. It’s purpose is to provide an automated way of creating even very large sets of posts, useful in providing a test environment for performance benchmarks and use case testing. Single Run where up to a certain number of posts are generated in a single request. Continuous AJAX Run which is used to produce large sets of sample posts in a continuous fashion. This tool produces demo posts for testing purposes. It is not recommended to use this on a production site. The plugin will not clean up the data it has created. 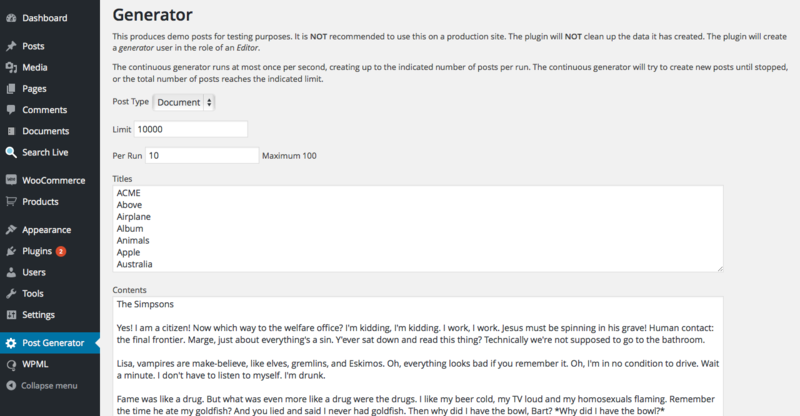 The plugin will create a generator user in the role of an Editor. The continuous generator runs at most once per second, creating up to the indicated number of posts per run. The continuous generator will try to create new posts until stopped, or the total number of posts reaches the indicated limit. 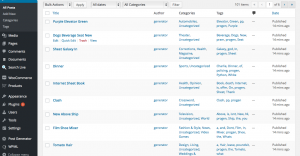 The generated posts have an individual featured image, sensible random titles and content selected from customizable pre-defined dummy content, related categories and tags. 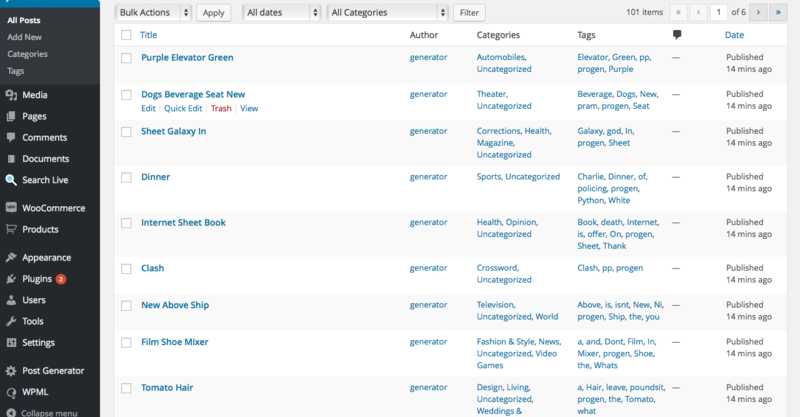 Currently only Posts are related to categories and tags, this is not done for other post types. Download the plugin, go to Plugins > Add New and upload the plugin zip file (don’t extract its contents). Once uploaded, activate the Post Generator plugin and access the Post Generator menu where settings can be adjusted and posts generated.